Moving house means a tight belt in our household this Christmas, so our nearest and dearest will receive handmade presents. We used to spend a fortune on family and friends at Christmas, but now we have Sprog and have just bought a house, we’re understandably counting our pennies! To celebrate it being Sprog’s first Christmas, we thought why not create a keepsake for everyone. 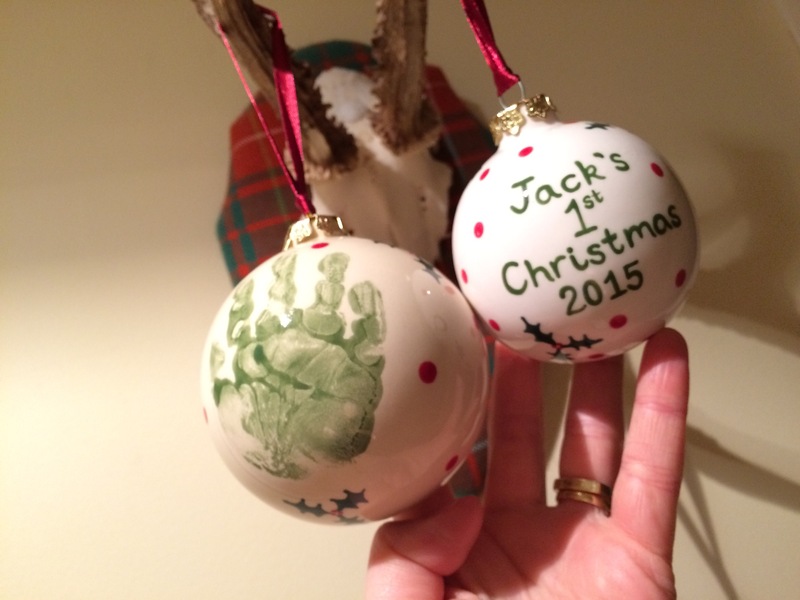 Inspired by the footprint plate we painted when Sprog was just weeks old, I booked a trip to Pick a Pot and Paint to create personalised Christmas baubles for everyone. Admittedly all Sprog and I did was pop a handprint on. The lovely Georgia at the shop did the rest, the writing, the holly and the ribbon. Although not too cheap, they mean something and we really enjoyed going and doing them. Sprog managed six hand prints without crying/squirming, RESULT!